Hetzner Review 2019: Is Hetzner a Good Hosting? Hetzner Online offers shared, cloud, and dedicated hosting from data centers in Germany and Finland. 99.9% uptime is guaranteed for all plans, and advanced webmasters can take advantage of competitive pricing on managed server plans with SSD storage. Hetzner Online is a veteran web hosting company and data center operator that’s been in business since 1997. It’s one of the top ten biggest hosting providers in the world and one of the few non-American hosts to hold this position. It offers managed and unmanaged web hosting via servers in Germany and Finland. Hetzner Online serves a large international client base and is a 2019 Intel Technology Platinum Provider. Support is offered in English, Finnish, and German. Hetzner presents itself as a stable web hosting provider that offers a wide range of European-based hosting plans to meet the needs of beginning and advanced webmasters. All shared hosting plans come with a 99.9% network availability guarantee and secure daily backups retained for 14 days. Symantec SSL certificates are included in every plan. However, domain names must be purchased separately. What you’ll notice here is that a lot of the better — and sometimes essential — features are limited to the higher-tier plans. This means that if you’re only going with Hetzner Online’s entry-level plan, you’ll find the service restrictive. Also unfortunate is the fact that while there’s compatibility with the WordPress and Joomla CMS, the large library of extensions you’ll find elsewhere are missing here. Advanced webmasters can benefit from support for the Perl and Python programming languages, though Ruby and Ruby on Rails aren’t available. Plans range anywhere from two to six CPU cores. Higher-tier plans also come with 1 Gbit/s guaranteed bandwidth. Unfortunately, no plan offers full root access. The good news is that the absolute prices are very competitive versus what you’ll find elsewhere for Western European servers. Webmasters running high-traffic websites and e-commerce stores with a lot of traffic coming in from the continent will find good value for their money here. There are four different shared hosting plans. The lowest-tier plan comes with 5GB of disk space, 10GB of traffic, and 128MB of memory and is competitively priced as an entry-level option for beginning webmasters, albeit with fewer features. However, there are problems with the pricing model as you move up the tiers. For starters, the price-to-value ratio is good but not great — a tenfold increase in price will get you a 40x increase in disk space and unlimited traffic, but just a 3x increase in memory. But the bigger issue is that the highest-level plan offers 200GB of disk space, but just 384MB of RAM — far less than nearly all advanced webmasters running a website large enough to need all that disk space will require. There is no money back guarantee on any plan. However, single month plans are available, so you can test the service out with no commitment to continue if you aren’t satisfied. Unfortunately, all plans also come with a one-time setup fee. Support options are in English, Finnish, and German and are excellent. 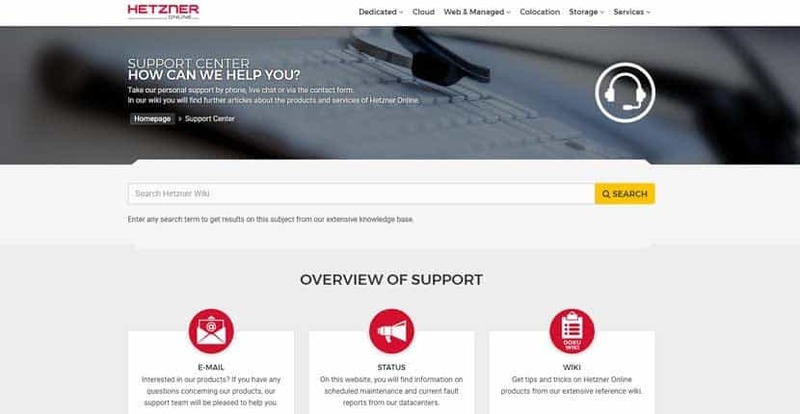 Knowledgeable technical support from on-site data center technicians is available by phone 24/7, and you’ll get a response to email inquiries within 24 hours. In addition, there is a large self-help knowledge base that will answer both administrative and technical questions. Hetzner Online claims that live chat is available, but there was no option on its main website, so you may need to login to access it. Intel® Xeon® E5-1650 v2 Hexa-Core incl. Intel® Xeon® E5-1650 v3 Hexa-Core incl. Hetzner Online offers PHP 7, free SSL certificates, and 99.9% guaranteed uptime. Beginning webmasters will find excellent functionality at low cost, but only with higher-tier packages. Advanced webmasters will probably need a managed server plan, but will also find it to be good value for the cost. Wondering how Hetzner stacks up against other Web Hosting companies? Enter any other Web Hosting company and we will give you a side-by-side comparison.